The Gold Star tradition began in World War I when families displayed a flag with a blue star for each family member fighting overseas. If the family member were killed in action, the family would replace the blue star with a gold one. The gold star symbolized the committed service of these men and the ultimate sacrifice they made in defending our nation. Fifty-six alumni of Chaminade High School were killed in combat and were honored in a most special way at this year’s Gold Star Mass. Held in the Activity-Athletic Center, Chaminade welcomed its Gold Star families and military service members of the United States. 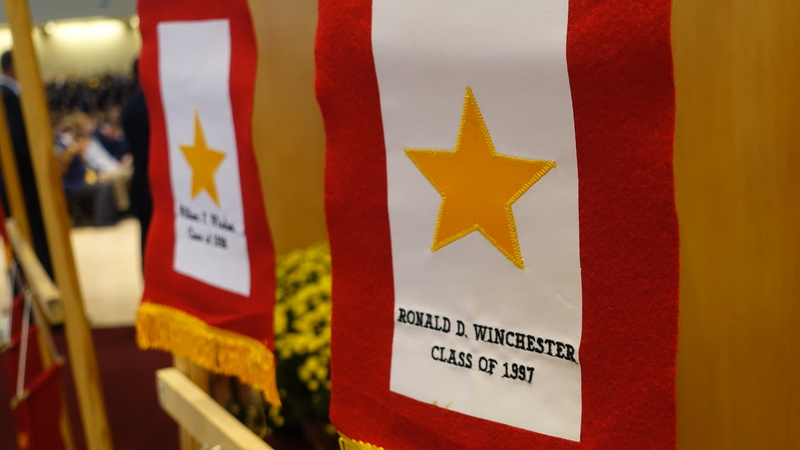 A gold star honoring Ronald D. Winchester ’97 hangs at the entrance of the AAC prior to the start of the Mass. The main celebrant of yesterday’s Mass was Fr. Timothy Hirten, an Air Force chaplain and Long Island native. After entering the seminary in 1987, Fr. Timothy was ordained a priest in 1993. Later, however, he was called to service and deployed to Iraq for two tours, as well as one in Saudi Arabia. Currently, he is stationed at Joint Base McGuire-Dix-Lakehurst in New Jersey. Throughout Mass, Fr. 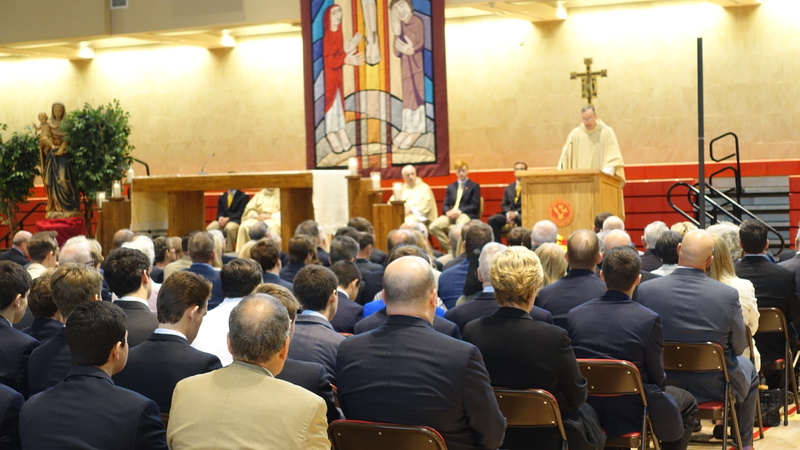 Timothy stressed the theme of “Service, Sacrifice, and Honor,” a message reflected in the Gospel reading and the heartfelt homily he delivered to his fellow servicemen, the Gold Star families, and the Chaminade staff and student body. The Gospel passage he read was from Mark 10:35-45. In the passages, the apostles James and John were talking with Jesus. Jesus asked them, “What do you want me to do for you?” Both answered, “To sit at your right or left, or to be with you in heaven.” Jesus told the apostles that they must first serve others if they desire to sit at His side. Fr. Timothy connected this reading to his homily about service, sacrifice, and honor by opening with several important examples. He reflected on Father Chaminade’s life and the lives of three specific Gold Star alumni, Sgt. James J. Regan ’98, Lt. Ronald D. Winchester ’97 and Michael LiCalzi ’00, to exemplify this message. All of these men exhibited the qualities of service, sacrifice, and honor. Fr. Timothy Hirten delivers his homily to both students and Gold Star family members gathered in the AAC. As a final example, he described his own life, mentioning his deployment to Baghdad in 2010. Shortly after his arrival in Baghdad, he was prepared to celebrate Sunday Mass with his fellow troops. Approximately 15 minutes before Mass was to commence, though, rockets and mortars struck the surrounding area. As the explosions became persistent, Fr. Timothy decided to cancel Mass and find shelter in the chapel with the other soldiers. Fr. Timothy then started to hear confessions, which took over an hour. After the confessions concluded, the incoming assaults ceased, and the men were able to resume their daily activity. He showed us that in that moment, many of the troops found God; he hopes that we too can find God in our difficult times. The family of Edward A. Ednie has attended the Gold Star Mass for many years in remembrance of Ednie, a Chaminade graduate of the Class of 1947. After high school, Ednie enrolled in the University of Dayton, and was a member of the university’s ROTC program. He had aspirations of attending Harvard University, but was required to finish ROTC training first. To fulfill this requirement, he served in the Army during the Korean War. Eleven days prior to the ceasefire, he was killed in action after stepping on a landmine while trying to save his comrade. Since 1930, hundreds of alumni of Chaminade High School have put their lives on the line in combat, 56 of whom lost their lives in defending our freedoms. With reverence for that ultimate sacrifice held close to heart, Chaminade has not only honored these men and their families with an annual Mass, but the school has dedicated its Gold Star Stadium to their honor. In inviting Fr. Timothy Hirten, a man who also holds the rank Major, Chaminade’s fallen alumni were remembered dearly. These men, true Chaminade Men in their collective act of “doing the right thing,” exemplified service through their tours overseas, demonstrated sacrifice in their unwavering commitment to the United States, and displayed honor through their selfless acts of bravery in protecting the freedoms of America’s promise. Posted in News and tagged gold star, gold star mass, spirituality. Bookmark the permalink.